Welcome to Opella Nova Records! Opella Nova Records provides its customers with exclusive recordings of unique musical repertoire from the sixteenth through nineteenth centuries, focusing on masterpieces and on first-rate musical finds that have not yet been recorded. The music is always based on the most up-to-date research and often stems from original musicological discoveries. Opella Nova’s CDs are a perfect addition to the personal libraries of serious music collectors. We are pleased to announce that Opella Nova Records has also recently become a registered independent BBC Radio 3 production company. Featured Release: An Italian Rant! Italian instrumental music captivated 18th-century Britain with its tunefulness, drama, and sheer beauty. 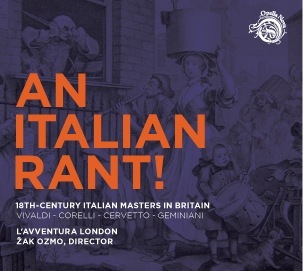 For this project, director Žak Ozmo has handpicked repertoire that allows L’Avventura London to explore a new dimension to several Italian favourites, including works by Corelli, Vivaldi, and Albinoni, and shed light on less known (but equally as beautiful) works by Geminiani and Paradisi. This disc also reveals the talents of neglected composer G. B. Cervetto with a premiere of his marvellous Sonata in G minor. If you haven’t yet had the chance to hear L’Avventura perform live, this fresh, fun disc is an excellent introduction to the group.